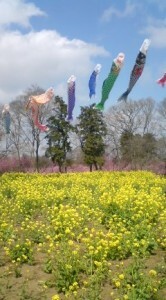 In Ibaraki Prefecture, lovers of traditional Japanese culture usually look forward to the period between mid- April and early May. 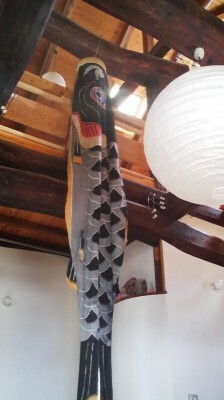 First there is the excitement of HANAMI ( Cherry blossom parties) and then there are the amazingly extravagant carp streamers ( koi nobori), which are raised up at the homes of families with boys, to be admired- and photographed. 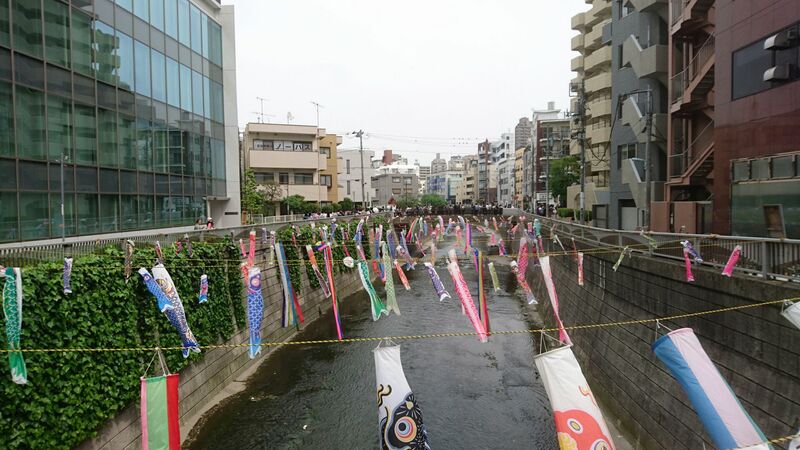 Sure, you can see plenty of carp streamers ( of a more modest scale) and other childrens Day decorations anywhere you go in Japan in this season. But before May 5th, there could be no better way of savoring this season than taking a drive or a bike-ride in the Ibaraki countryside. You are sure to see plenty of this area`s abundant, breathtakingly large and colorful koi nobori waving proudly against the blue sky. It is quite a spectacle! Let me tell you about how this, and other customs related to what is now called Children`s Day ( Kodomo no Hi) have evolved. When looking into the origins of various elements of Japanese culture, one often finds dual or multiple roots. Even beginning students of the Japanese language are confronted with this fact as they soon learn that there are two or more ways of reading kanji characters. There are even two ways of counting, the more purely Japanese way- hitotsu, futatsu, mitsu… and then the one based on the Chinese, ichi, ni, san. It is especially interesting to keep this in mind when discussing Japan’s calendar of traditional annual events.This month’s standout special day is Children’s Day (子供の日, kodomo no hi) which has come to involve an array of festive decorations and foods. 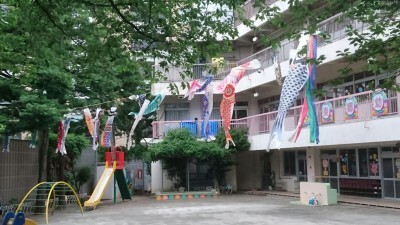 Most notably, there are the carp streamers (鯉のぼり), which can be seen proudly flapping in the wind (in this part of Japan, as I have already mentioned, we are lucky to be able to see especially large and elaborate ones) in people`s yards or balconies or displayed at shops and shrines. 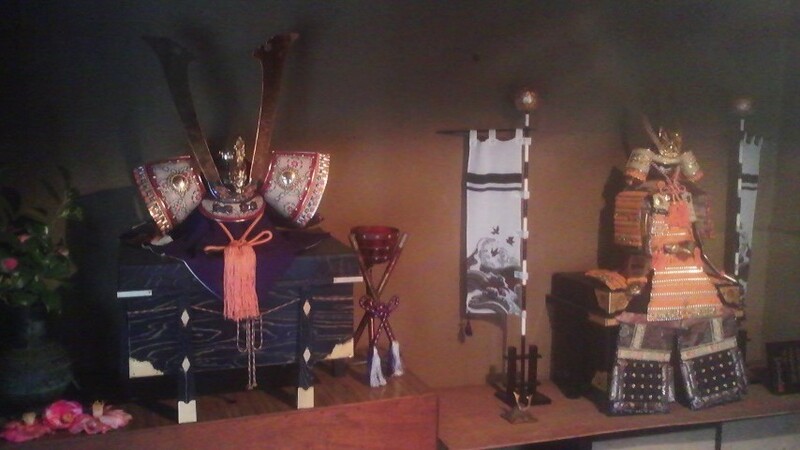 Inside people’s homes, or at restaurants and hotels we can also see the armor or warrior dolls (Go-gatsu ningyo) which have been put on display. Now, much less commonly, you can see a plant called shobu (菖蒲, this is a relative of the yam and NOT the iris – the flower whose name has the same pronunciation and the same Kanji character!) ) on sale for use in the bath, and even more rarely in this part of Japan (though you can still sometimes see it), placed on roofs, along with some mugwort (蓬,yomogi). At wagashiya (Japanese sweet shops) and convenience stores, kashiwamochi and chimaki are on sale, as the special sweets of the season. What does all this have to do with Children’s Day? 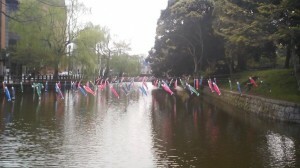 Carp-streamers strung across the Kanda river in Takadanobaba in Tokyo. In the background you might be able to make out an amazingly long line of people waiting to get into a YAKI NIKU restaurant. when adopted by the Japanese. To mark the seasonal changes, each sekku involved eating certain foods and displaying certain decorations. In those times the significance of these was usually one of keeping away bad luck or ritual protection. It now being May, the festive day of the month is of course (as stated above), Tango no Sekku, which is now known as the national holiday, Children’s Day. However, since this particular date has been recognized as being special since ancient times, there have been meanings connected to it which have changed over the generations. If you ask a Japanese friend about the significance of Children’s Day, they will explain that it is a day on which to celebrate boys and for families with boys to pray for their sons` and grandsons` healthy growth and success. This goes in tandem with March’s Momo no Sekku (March 3rd) which is a celebration of girls. 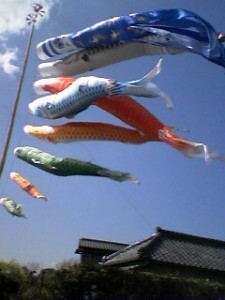 They will also probably explain that carp streamers symbolize strength and perseverance – important masculine attributes. The story of Tango no Sekku, however, is much more complicated than this, and its history and the origin of its customs are now unfamiliar even to most Japanese. In ancient Japan (and still today), this is the season for planting rice*. At this time of year, in order to pray for abundant crops, fertility in general as well as for removing impurities from the village, young women ( called 早乙女, saotome) would spend a day isolated in a special women’s huts called onna no ie (女の家). This hut would be covered with a plant called CALAMIS (SHOBU, in Japanese) and mugwort, which in ancient China were believed to have purifying powers (because of their strong smells). 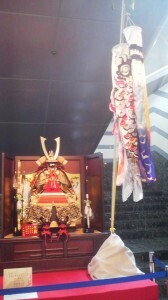 Remnant features of this ancient practice can be seen surviving in the Heisanbo Festival held each May 5th at a small Kashima Shrine in Dejima, on the shore of Lake Kasumigaura. In the Nara Period (710-794), the Japanese would decorate themselves with garlands of shobu and later in the Heian Period it was common (and still is) to decorate homes with these protective plants. 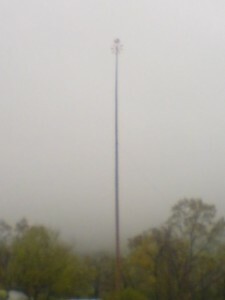 At this time tall poles would also be set up by rice fields to welcome the God of Fertility. This photo shows shobu (calamis) stems and mugwort (yomogi) on the roof of one of the old samurai residences which are open to the public, in Sakura City, Chiba. Later when Japan came under military rule, the Japanese name for the plant shobu, came to held significant for its homonym, 尚武, shobu, which means reverence for martial arts. Thus, the plant shobu has remained a part of Tango no Sekku throughout the generations and many Japanese still use it in their baths on this day for driving away evil and fortifying the body. It is surprising that most Japanese today confuse the traditional shobu with HANA SHOBU, which are irises. These extremely beautiful purple flowers can often be seen being usued as INCORRECT symbols of Tango no Sekku, at shops, etc. It was during the years of military rule that Tango no Sekku came to be associated with boys. One possible explanation for this can be that it had originally been a day to isolate women, and that left the boys to be celebrated! Kashiwamochi as it looks when it is bought or served- with this particular sweet, dont eat the leaf! 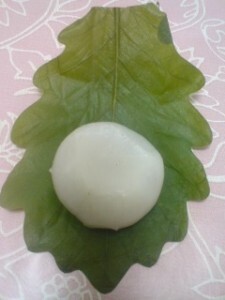 Kashiwamochi, the traditional sweet most commonly associated with Tango no Sekku is a pounded rice cake wrapped in the leaf of a Japanese oak. Eating this sweet in this season is an original Japanese custom and signifies the connection between generations, as these trees don’t lose their leaves until fresh leaves have appeared! 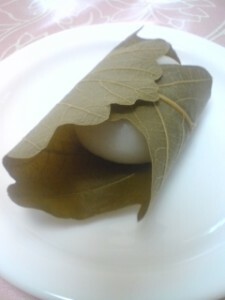 Eating chimaki, a conically shaped paste wrapped tightly in leaves, is a custom which originates in China. May 5th in China, is the memorial day of the great poet scholar Qu Yuan (屈原, read Kutsugen in Japanese) who was famed for his loyalty. On the 5th day of the 5th month, men would throw offerings into rivers (he drowned in one) in his honor. At one point, many men at different locations dreamed that it would be better to wrap these offerings in purifying leaves. This became standard practice, and is common today in Japan. 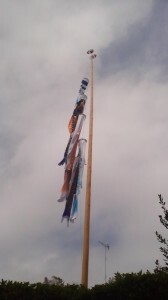 Raising carp streamers probably is a continuation of the native practice of setting up poles near the rice fields to welcome the rice god. Since Tango no Sekku came to be a day of celebrating boys, Japanese in the Edo Period (1600-1868) adopted the carp as a symbol of success. 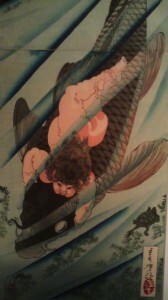 This is because of the ancient Chinese story of the carp struggling upriver and transforming into a dragon. Another interesting reason for the samurai to have admired carp was the fact that this powerful fish, struggles desperately when caught, but when placed on the cutting board, it resigns itself to its fate, and dies with what the Japanese warrior class thought to be DIGNITY. Anyway, the merchants of the Edo Period always tried to emulate the ruling warrior class. They were, however, forbidden from hanging a family crest. 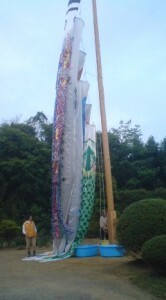 Carp streamers were raised in their place, with one family trying to outdo the other in extravagance. This custom spread throughout Japan and can especially be enjoyed in Ibaraki where farmers often display fantastic and very expensive koi nobori sets to celebrate their male offspring. The reason for this is that farmhouses in Ibaraki are on average the largest in Japan and many families have large yards (within compounds) in which to raise the high poles needed for the giant streamers. For those who live in smaller abodes there are appropriately-sized streamers and even tiny origami or cloth carp. Finally, there are the dolls and armour which are displayed. Grandparents often spend thousands of dollars on a display for their grandsons, though if you want some dolls for yourself you can get the same exact dolls for a song at second hand shops (since many Japanese would not buy or are even afraid of used dolls!). These dolls became popular in the late Edo Period as emulating the Samurai class was all the rage for the merchants and then farmers. These dolls and armour are displayed to pray for boys success and health and can be found in a myriad of forms. After the war, since the day had been associated with warriors, the name was changed to the more egalitarian Children’s Day, though girls and boys are still actually celebrated separately. There are many other, more obscure decorations for this season, but I have written too much already, so go search them out for yourselves. * One thing that always complicates Japanese culture is the fact that the calendar was changed! In 1871 the government adopted the Western Calendar and as a result the SEKKU as they are celebrated today fall about one month earlier in the year than they usually did. In some areas of Japan certain SEKKU and other festivals and holidays and celebrated according to the old calendar. Interestingly, however, in the case of Tango no Sekku, this one month difference does not now make much of a difference because the rice transplanting season has also moved up about one month earlier in the year- so the raising of the long poles still coincides with the ancient tradition of setting up poles by the paddy fields before transplantation. It does, however, make people forget that this festival was held nearer to the time of the summer solstice and that the taking of Calamis Baths (SHOBU YU) mentioned above, were a perfect balance to the Citron Baths (YUZU YU) taken on the day of the winter solstice. 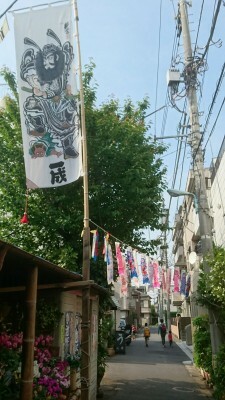 Can you write a post on the banners in Japan and the banners’ history. I see a lot of banners almost everywhere.